About once a month, we post something new to Soundcloud. Lately this has been unreleased material, especially from our silent film soundtracks since those were never released as albums. We will also be writing and posting new material. Half Off All Music and T-Shirts! It's truck month. 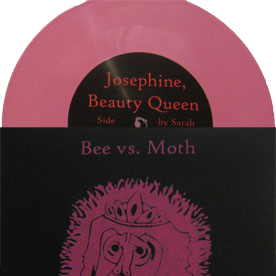 We've got cool T-Shirts, limited vinyl pressings, custom cassettes, and official Bee vs. Moth kazoos. And it's all half off our normal prices! Stream our 2014 album, Shelter in Place, for free on Soundcloud. "Problems with Crowds" premiered on Pop Matters. Shelter in Place features our new guitarist, James Fidlon, and a variety of instruments unlike any of our previous albums. If you enjoy the album, it is available on Bandcamp, iTunes, Amazon digital, and on CD. The album's music videos are on our YouTube channel. A video from our 2014 album, Shelter in Place. We wrestled ancient VHS technology and wound with some impressionistic analog nostalgia.